Four-Mile Point features a universally accessible marsh viewing platform. 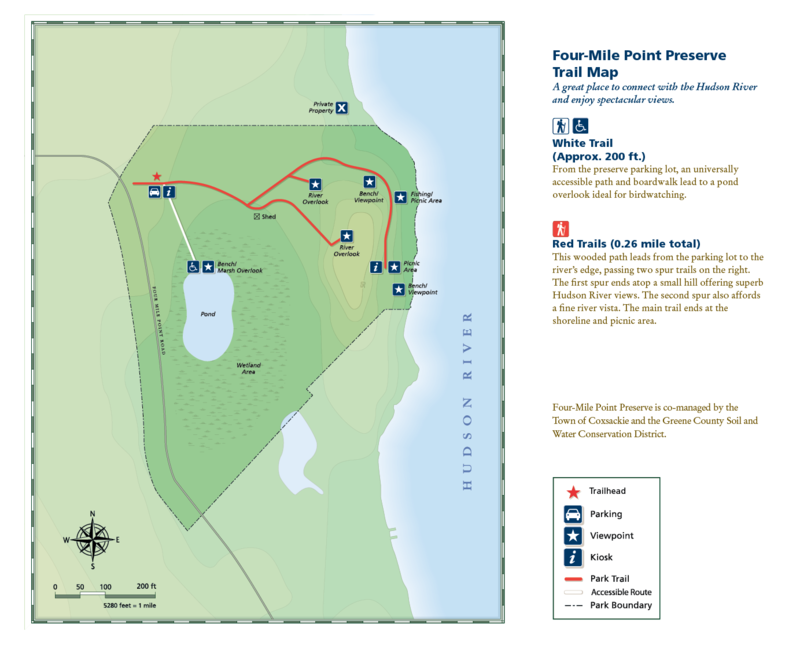 COXSACKIE, Greene County (7 acres)—Located midway in the Hudson River's eight-mile course between Hudson and Coxsackie (hence its name), Four-Mile Point long was a hive of activity. For 6,000 years, it was the site of a Native American tool-making workshop; the long stone blades fashioned here were used to butcher fish and game. In the 19th century, a large icehouse stored frozen blocks cut from the river — as much as 55,000 tons worth — awaiting shipment to Manhattan during warmer months. While traces of this bustling past remain, the land now invites more tranquil pursuits. In fact for a small park, there's an awful lot to explore. 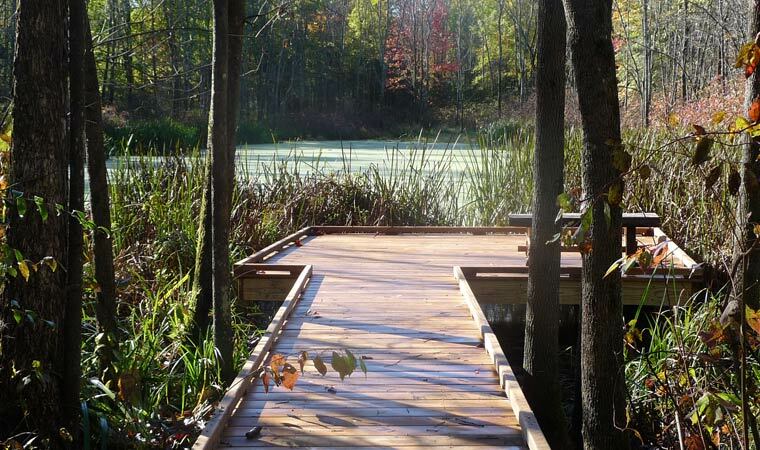 An observation platform invites up-close inspection of a small wetland that furnishes critical habitat for birds and amphibians. Grand Hudson River views await those who reach a bluff-top overlook. And the walk is all downhill to the piece de resistance — the river itself, where a fishing pole, a kayak or a picnic would come in handy, but none are necessary to savor the scenic splendor. A short, wide trail leads to the sites described above. Crossing Rip Van Winkle Bridge from east to west, turn right at first traffic light onto Route 385 north. Continue 7.6 miles. Right on Four-Mile Point Rd. Parking area on left.